File this under "stuff nightmares are made of." 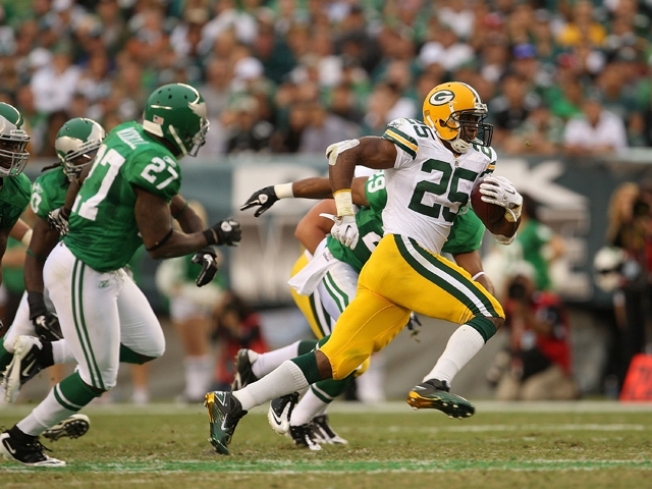 Ryan Gant ran for 45 yards on eight carries, a decent chunk of the Packers' 132 yards on the ground. The playoffs are here! THE PLAYOFFS ARE HERE! YEEHAW! WOOHOOOO! A full weekend of NFL double headers. It’s like a dream come true. Only it’s REAL! And there’s food! As you know, not all playoff games are created equal. There’s a reason Saints/Seahawks got thrown on Saturday afternoon with NBC’s B team. That’s the dud game and everyone knows it. But I have found, over the years, that the playoffs have a way of subverting your expectations. The game you think will be good ends up being a dud, and the game you think will be awful ends up being the classic. 1. Packers at Eagles The Eagles can’t defend the pass, and no one can defend Michael Vick. Sounds like appointment television to me. The last time Michael Vick played the Packers in the playoffs, he dealt Packers their first-ever home playoff loss. Vick has a knack for making history, both good and bad, so you’d best tune in. 2. Jets at Colts It’s a rematch of last year’s AFC title game, which actually wasn’t that good, but hey, you never know if the second time’s the charm. Plus, the Colts really aren’t good this year. You could end up seeing Peyton Manning throw a game-ending pick well before the Super Bowl this year! And that’s a treat. 3. Ravens at Chiefs Through no fault of their own, the Ravens have a knack for playing excruciatingly boring playoff games. I have no clue why this is, but tell me: Do you remember a single memorable Ravens playoff game? Even one? Maybe that one game where they beat the Titans when they weren’t supposed to? I dunno, man. For some reason, the Ravens just don’t make for classic playoff television. But this game will be in KC, and the crowd will be insane, so it’s still worth your time. 4. Saints at Seahawks Oh, it’s gonna be a bloodbath. But bloodbaths can be fun, too! So get excited, gang. The playoffs are here. Open your beer. Make your chili. Prepare yourself for the goodness.